Possibly the most advanced amplifier available in the early 60s, complete with tremolo, echo, reverb and a built-in microphone stand. The Joker included a valve Copicat built into the chassis, and seems to have been intended as a self-contained guitar amp and PA system for a guitar-playing singer. 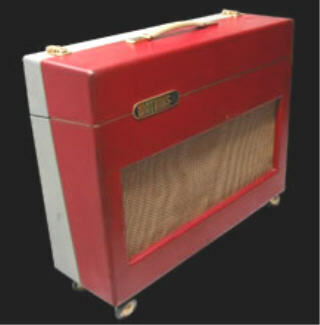 An early 60s amp, the Joker came with two-tone red & grey coverings and a red control panel which distinguished it from other Watkins cosmetics of the era, possibly deliberately. There are un-confirmed sightings of all-black and black & grey models. It is very rare today to find working models in original condition. It seems that they may have been produced for quite a limited period, maybe 1962-63. A sub-baffle suggests that it may have been intended to offer the Joker with different speaker configurations : 2 x 10 or even 2 x 12 would fit, but most Jokers are found with a single 12" Watkins-labelled Goodmans Axiom 301 speaker, some having in addition a small horn. A "magic-eye" valve on the control panel measures the tremolo speed. With no less than 17 valves inside there may have been reliability problems.